Is Facebook planning on sharing information about the words that people use on the site in messages, and demographics about the people behind those messages? 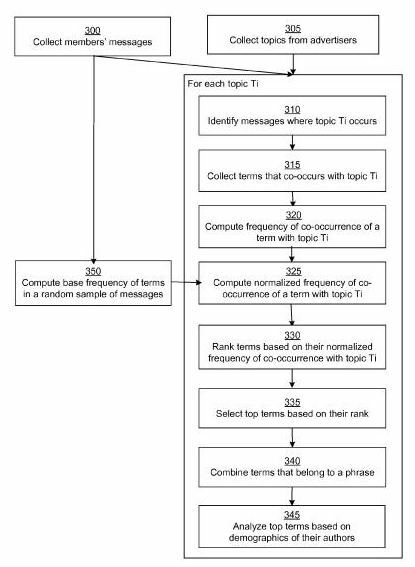 A couple of patent applications published today at the US Patent and Trademark Office describe how the social network might analyze the messages of members, to identify popular topics and the words that co-occur in messages that contain references to those topics. They also describe how demographic information supplied by members might be used to graph those topics. The following images are a couple of examples of one way that kind of information might be displayed (click on the images to see larger versions). The first displays mentions of President Obama from messages dating back 14 days from July 21, 2008, along with many of the most popular words or phrases that accompanied those messages, as well as information about what percentage of those mentions came from males graphed against the average age of those members. Topics displayed by this system can cover a wide range of topics included in Facebook messages, as the second image shows mentioning “Hip hop,” along with popular terms included in those messages. The patent filing descriptions begin with a discussion of the limitations of opinion polls, surveys, and focus groups. They go on to tell us how those shortcomings might be solved by mining data from messages sent by members of a social network and analyzing demographic information associated with those members. 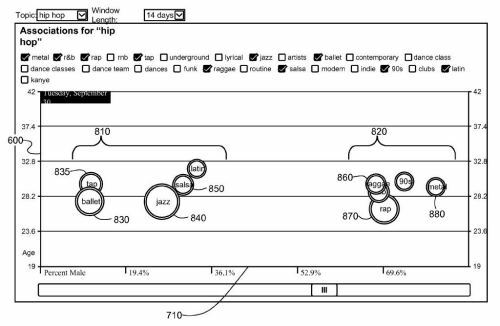 One question I had when I started reading these patent filings is where might Facebook get the topics to collect information about? Another was who would be shown this topic and demographic information? Users in public forums often mention certain topics in the course of their discussions. Member’s comments in messages to other members are analyzed to obtain terms that co-occur with topics. Frequencies of co-occurrence of a term with topics are normalized based on frequency of the term in a random sample of message. The terms are ranked by their normalized frequency of co-occurrence with a topic in messages. The top terms are selected based on their rank. Analysis of demographic information associated with members that mentioned top terms associated with a topic is displayed in graphical format that highlights the relationship between the age, gender, and usage of the top terms over time. The demographic information presented includes average age of members that mentioned a top term or their gender information within a selected time interval. We aren’t told if this demographic information would only be displayed to advertisers, or if it would also be available to members of the social network. The images above about President Obama and Hip Hop are examples of one way that information might be displayed. Displaying trend data over time is another possibility. How does this make you feel about Facebook? I think facebook does not know the word privacy. However, nowadays, any information you place on the internet becomes public property. So I guess every individual just needs to choose what information to display and what not to. Let them do what they will and what they can with the information I post but I will surely be cautious and wary of those things. Surveys stay anonymous, it makes a big difference and protect people. Nothing protects you on Facebook where anonymity is broken by your best friends. Privacy concerns have definitely followed Facebook from its earliest days, and even in the site from Mark Zuckerberg that preceeded it, facemash. I agree that people should be careful and concerned about what they choose to publish about themselves on the Web. Unfortunately, others may publish things about you on the Web that you may not necessarily want online as well. I’m wondering how much our concepts and concerns about privacy have changed and evolved since the start of the Web. 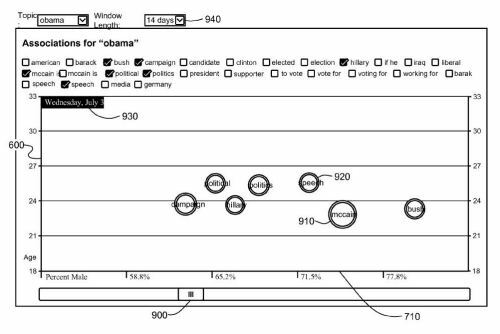 I mentioned in my post that the description from this patent starts off with a discussion about some of the limitations of polls, surveys, and focus groups. It doesn’t go into some of their strengths, such as the protection of the privacy of the individuals participating. The only mention of the word “privacy” in the patent filings is a description of how users of Facebook can limit the access to some of their information to different groups. This looks a lot like Facebook’s old Lexicon product. While it’s not active now it was a bit like Google Trends or Insights for Search. See RWW’s write-up on Lexicon. Perhaps it’s being revived with an advertiser focus? 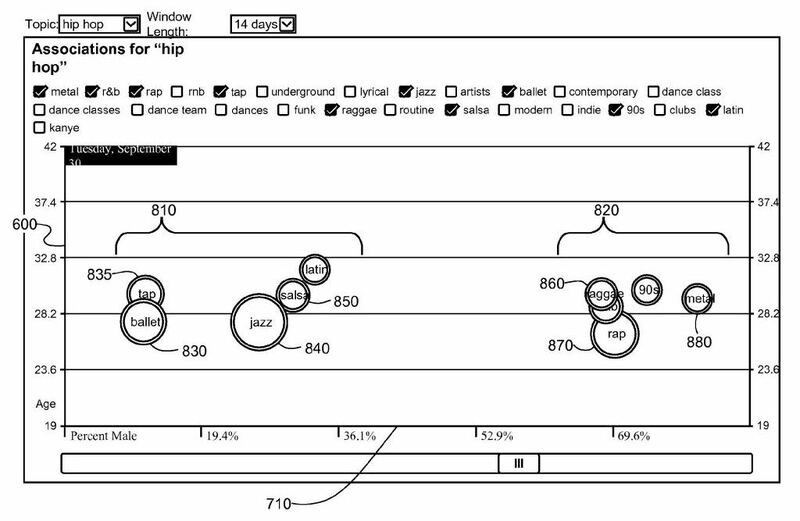 The formatting shown on the RWW page for Lexicon is a little different, but the idea of being able to track trends regarding words showing up on Wall messages is mentioned in the patent filings. You’re welcome. I do think that there is some value to Facebook, but their many approaches to privacy leave some questions to how much they are concerned about protecting the privacy of people who use the site. People should really consider carefully the kinds of things that they do upload to Facebook. Ultimately Facebook is a business that provides a free service to its users. Although privacy is everyone’s right, do we honestly expect Facebook to provide its service without the aim of financial gain? Are Google, Yahoo, or Microsoft any different in this sense? Personally, I don’t love the idea of my private information being used toward targeting ads at my “demographic”. This being said, it seems like this data would likely have to be anonymized during the normalization and analytics regurgitation process. If people don’t like their information being used on such services, by all means, delete your Facebook account. I know I won’t. From a privacy level, how is this particular patent/idea any different from Google using Gmail for ads? Call me a product of my generation, but I honestly do not understand why people get so upset about Facebook’s privacy issues more than anything else we do online. Does the level of concern stem from the nature of the information we put on Facebook (ie, because it is-or at least seems-more ‘personal’)? I do think that Facebook can find ways to protect our privacy while still making a profit. I’m not always sure that the “if you don’t like it, don’t use it” approach is always the best one to take. I’m wondering how people would feel if Google went beyond displaying ads on Gmail to mining the topics of emails, and letting advertisers know what people were discussing when they mentioned those topics. I would suspect that it might upset a few people. That sounds a little like Caveat Emptor!, or “let the buyer beware.” I do think we should have some expectation of lines that might not get crossed when we use a service like Facebook or Gmail. This just doesn’t smell right. Facebook may indeed overtake Google in the next five to ten years, and the fact that they are mining personal data is something that is a little sickening to me. It is already bad enough that information can be posted beyond your control, but now they can read your messages too? I’d imagine that this process is fairly automated, much like Google’s advertisements in Gmail. I’d also suspect that most people using Facebook don’t realize that Facebook might potentially be sharing information from their messages in a manner like this. I am more and more considering Facebook referral traffic (stemming from groups, fan pages, like buttons) as the fourth wave of super-organic search – kind of pre-qualified or pre-vetted by ones friends and associates – superior in its own way from even organic search. Have heard from PPC practitioners that paid placement on facebook is a low-yielding exercise and obviously from a straight SEO perspective it is all nofollow but I am looking at this from a referral traffic perspective. Interesting point. When someone visits from Facebook, their intent on visiting a site might not quite be the same as when they perform a query at a search engine. They may be more interested in casual browsing and discovery than they are in purchasing something or learning about a service that you offer or solving some kind of informational or situational need. In that case, does it make sense to try to provide something on your web site that will reward people who may potentially think of you and your site in the future when they might be interested in making a purchase or somehow fulfilling an informational or transactional need, even if they are presently more interested in just browsing the web after learning about your site on Facebook? Something that might get them to bookmark your pages so that they may return in the future with a different intent? Facebook is definitely becoming more of the overall online marketing strategy for our dental practice. Even though most people may not be quite in the buying mood, we have still found that traffic from Facebook has resulted in phone calls and appointments for our services. Is it as targeted as organic search? In my opinion no, but that is surely debatable and probably varies depending on your target market. The only hesitation that I have about relying too much on a site like Facebook is that you have little control over how the site is run, and how it might possibly change in the future. I’ve used a number of services in the past on third party sites to create higher visibility and potential referral traffic to my pages and business, and had them change for one reason or another, such as being acquired, or closing down. Using Facebook can be an effective way to bring people to the pages of your site, start conversations, and build lasting relationships. I think it’s worth pursuing. But I would make it only a part of the promotional efforts for my business. For a dental practice, I would definitely recommend attempting to rank well for Google’s Local Search as well, since many of the things you would do while doing that is to try to get as many positive mentions of your business on local directories, review sites, etc., which can also lead to direct traffic as well. I agree with a lot of what has been said. It seems to me that the best new customers come from the long coveted “word-of-mouth” even when that “mouth” is a Facebook post or share. Promoting the Facebook page just to get “Likes” has been fairly worthless, but working to put up share-worthy content has been very valuable. You just can’t buy pass around. 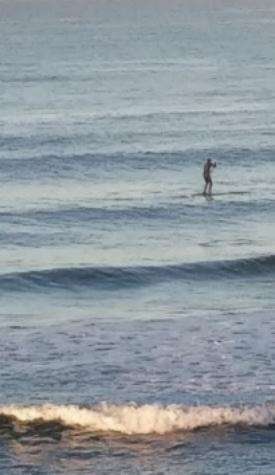 Because you have to earn it honestly, is has not been polluted and devalued by the army of marketers out there. I’m convinced that 90% of all links online are put there by marketers trying to game the search engines. Real people share on Facebook these days, not link from web sites. I think link based strategies are getting thinner and doomed to be replaced by more credible social media. Very good points. Social networks are for sharing, for discussing topics with people who may hold some common interests, for building positive relationships, and using them to try to manipulate search results probably isn’t the best use of most peoples’ time and efforts. I’d much rather get someone to actually like something I’ve shared or written or done than to accumulate as many “likes” as I can.